We thought it might never happen… but it has. For years, greyhounds have suffered and died at Tucson Greyhound Park (TGP), Arizona’s last dog track. It was in 1939 that the Grand Canyon State became one of the first to legalize greyhound racing. Five tracks were built and operated over the years, but only “TGP” remained. Today I bring you fantastic news about our fight to end dog racing. 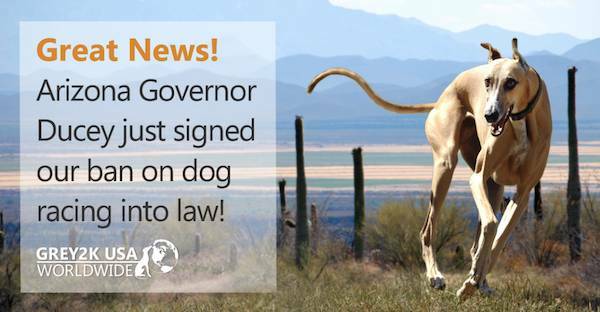 Arizona has just become the 40th state to make dog racing illegal! Governor Doug Ducey signed our ban on dog racing into law today. Even better, Tucson Greyhound Park (TGP) is already winding down and will hold its last race on June 24. We offer heartfelt congratulations and thanks to our dog-loving lobbyist Michael Preston Green, Tucson Greyhound Park representative Michael Racy and all the grassroots volunteers who have fought so hard to bring the greyhounds to this wonderful day. We thought it might never happen… but it has. For years, greyhounds have suffered and died at Tucson Greyhound Park, Arizona’s last dog track. It was in 1939 that the Grand Canyon State became one of the first to legalize greyhound racing. Five tracks were built and operated over the years, but only “TGP” remained. Things were so bad there. Greyhounds were left to languish inside barren warehouse-style kennels. Many wore muzzles, a kind of double caging. The poor dogs had limited access to water and subsisted on a diet of raw, diseased meat. There were no toys for them and no play. What a terrible life!